Bernie DeWit OTR/L started her own therapy company in 2013. 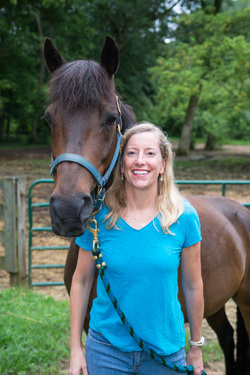 Bernie has been a practicing Occupational Therapist since 1988 and has been incorporating hippotherapy in her sessions since 2002. She has extensive experience working with children in a variety of settings including the "Babies Can't Wait" program, sensory integration and therapeutic listening programs. She is a level one and two registered American Hippotherapy Association Therapist and a PATH International Certified and Registered Instructor. Bernie is currently offering programs in Canton and Alpharetta. *Level II – A therapist who has completed both Level I and II AHA Approved Courses who demonstrates clinical problem solving with respect to clinical reasoning, the Hippotherapy Conceptual Framework and application of the Disablement Model. They have clinical application of NDT, SI and Motor Learning within the hippotherapy treatment strategy.